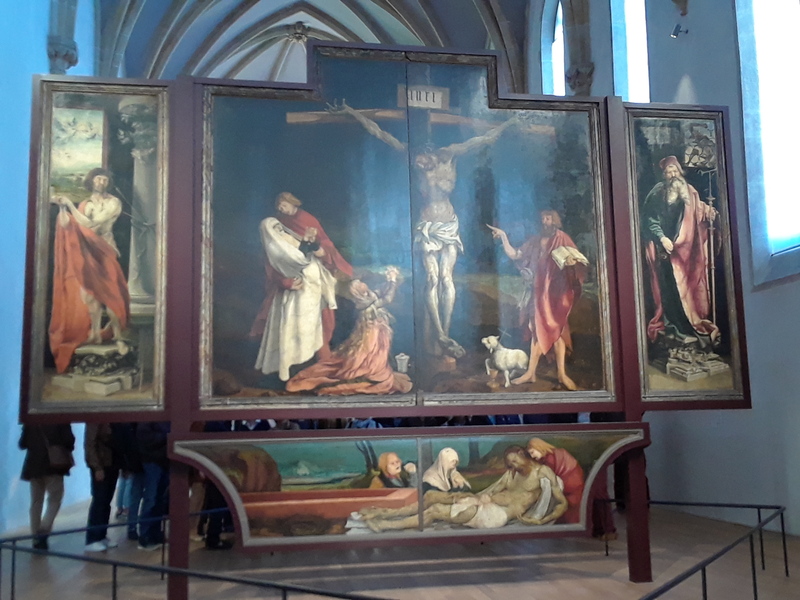 Like Notre Dame the Isenheim Altarpiece has been through many dangerous times since its creation in the 1500s, but it has survived to remind us of Christ’s death and resurrection! On Good Friday and Easter we remember and celebrate that, “ . . .the Son of Man did not come to be served, but to serve, and to give his life as a ransom for many.” Matthew 20:28. In Grunewald’s crucifixion panel, darkness is the backdrop for one of the most moving crucifixions in all of Western Art. “When he had received the drink, Jesus said, ‘It is finished.’” John 19:30. He then committed His spirit to His Father and died. On the left Mary, who in the Christmas Picture, looked with such love on her baby, now looks with anguish at her dead son. John and Mary Magdalen show the intense grief and shock that all the disciples must have felt. Is there any hope? Yet, even in this darkest hour, Grunewald gives his viewers hope. On the right the artist has shown John the Baptist with a lamb at his feet and holding an open Bible as he points to Jesus. Long before, when the Israelites were slaves in Egypt, God had them choose a lamb to bring into their homes for 4 days. John heralded Jesus’ coming when he said, “Look, the Lamb of God, who takes away the sins of the world!” John, John 1:29. Jesus then preached and ministered among the Israelites for 3 or 4 years. He entered Jerusalem on the day the Passover lambs were chosen, (Palm Sunday) and was crucified 4 days later. On that original Passover the Israelites killed the lambs after the 4 days and put their blood on the doorposts and lintel of their homes so that when the angel of death passed through the land that night, he would Pass Over any home with the blood of a lamb over its doorway. Each year Jewish people were to look back and reenact that event that freed them from earthly slavery, but God also meant for Passover to look ahead to Christ’s coming, when He, as the perfect Lamb of God, would give Himself for us, shedding His blood on the cross, so we can be freed from an even worse slavery–slavery to sin, and fear of death. So John holds a Bible and points to Jesus to show that Jesus came to die according to God’s wise and loving plan. To further emphasize this truth, the lamb at his feet holds a cross. Jesus gave Himself as the perfect and once and for all sacrifice for our sins, so we can be forgiven and reconciled to God. Next we look under the crucifixion to a small scene showing the disciples preparing Jesus’ body for burial in a white shroud. There is no life in Him, and at the end of the day on Friday, His disciples buried Him. Again there seems to be no hope. In Grunewald’s final panel, we see a most beautiful and amazing resurrection scene. Jesus has risen in power and glory from the grave; the guards have fallen in fear and awe. They and the stone could not hold Him, and neither could death. His body, once so pale and marred by death, is now alive with warmth though His wounds still show. The cold, white shroud of death has turned to warm reds, oranges, and yellows as Jesus rises from the grave. He has defeated Satan and death so that we can be saved to live forever with God. Put down your burdens of sins, of regrets, of striving to be good enough, and accept the free gift of forgiveness and salvation that God longs to give you when you humble yourself to accept Christ. Hallelujah, He is risen! The two photos of paintings from the Isenheim Altarpiece were taken by the author. 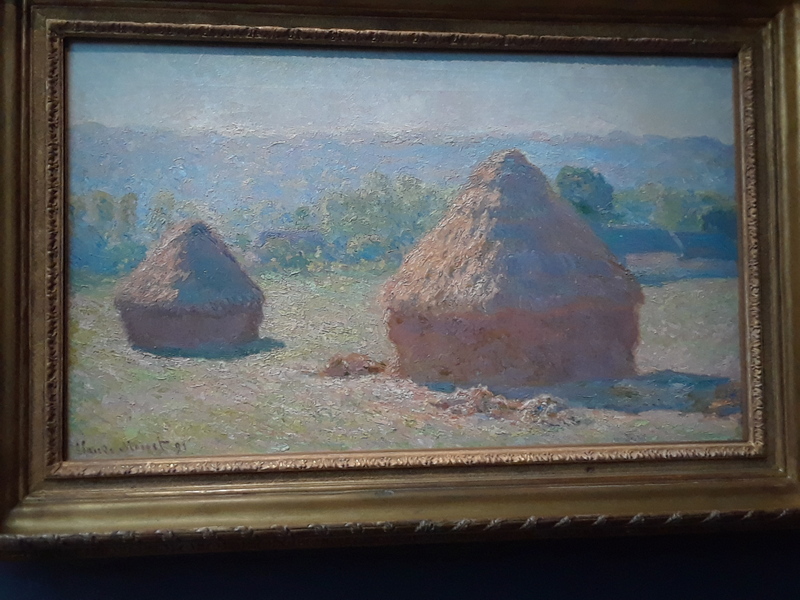 The next kathythepicturelady post will be devotional to go along with my series on Monet’s cathedrals and haystacks. 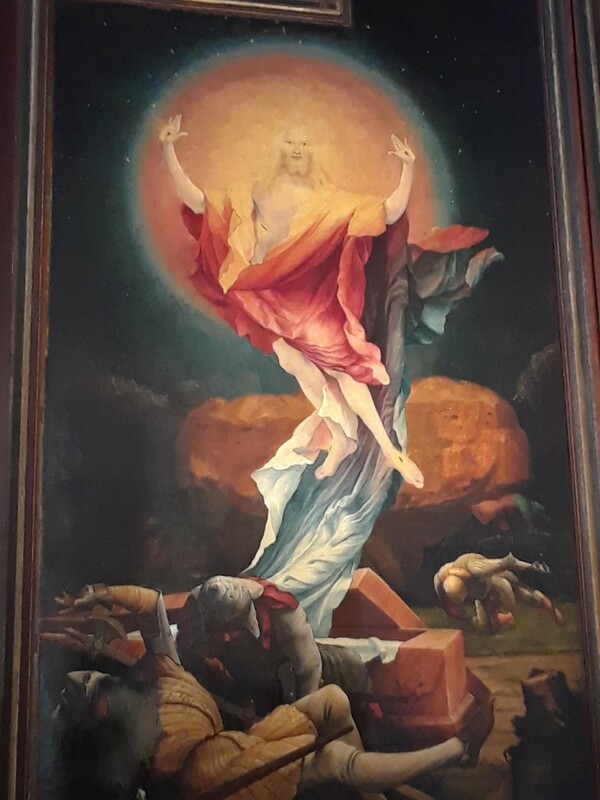 This entry was posted in Uncategorized and tagged Christ's crucifixion and resurrection, Easter, Good Friday, Isenheim Altarpiece on April 18, 2019 by Kathy The Picture Lady. If you’ve been following the news, you know that more of Notre Dame has survived than anyone could have hoped! 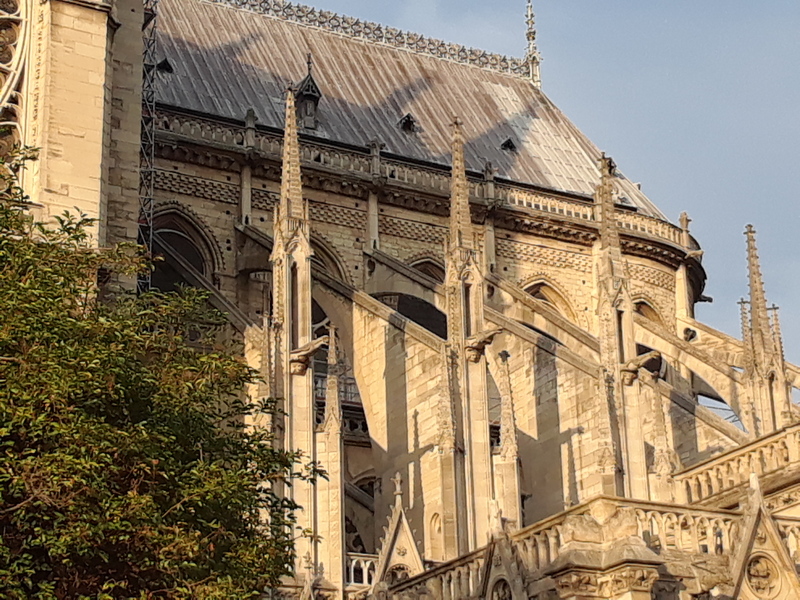 The bell towers still stand, as does much of the outer shell, thanks to those flying buttresses built long ago by Medieval stonemasons and the heroic efforts of Paris’ firemen. What wonderful news! Pray for the fireman who was injured. One incredible video shows firemen looking into the nave and the undamaged cross on the altar shines brightly, while the stone walls still soar upward. Amazing! 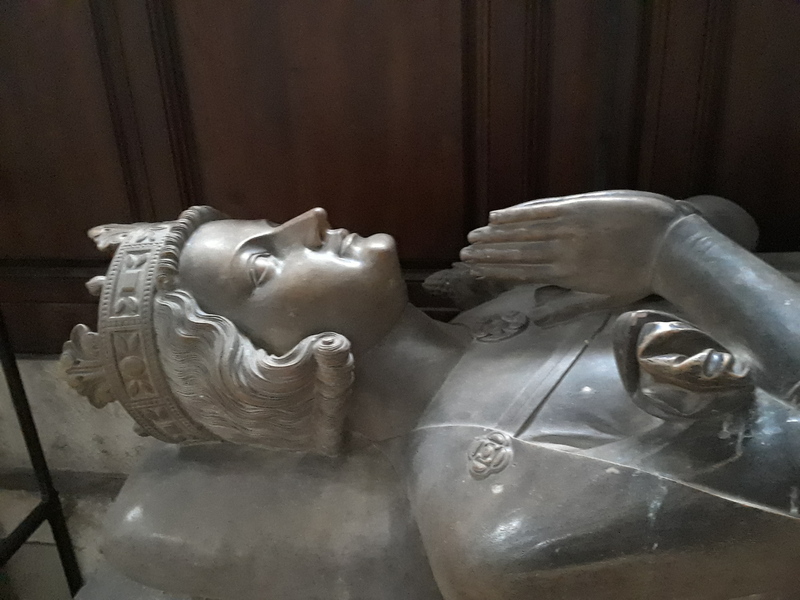 Many Gothic churches have suffered as much or more damage in the past from fires, wars, and storms and have been rebuilt. 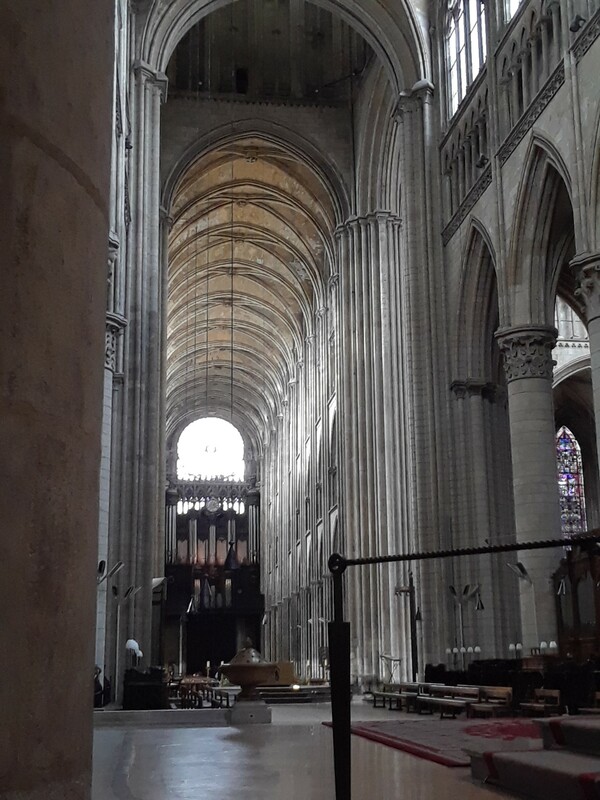 In my recent post about Rouen cathedral, I mentioned the devastation it received from bombing in WWII, and Chartre rose again from the flames way back in the late 1100s. President Macron has promised Notre Dame de Paris will be rebuilt! And hopefully millions of visitors and worshipers will again be able to enjoy this beautiful Gothic cathedral ads stand where we did in this photo from last fall. It was a beautiful sight to see and hear so many French people singing and praying in the streets last night. It’s been inspiring to hear the media saying things like the true church isn’t the building (as beautiful as Notre Dame was) but the people who gather there to worship God. Perhaps best of all have been all those who have talked about seeing this destruction and the coming rebuilding as a picture of Jesus’ resurrection from the dead that we will celebrate this coming Sunday. 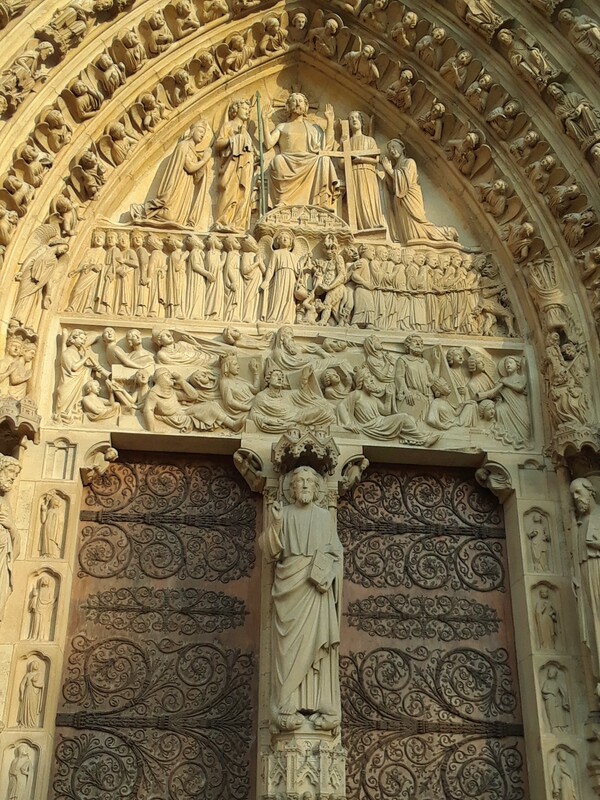 Please revisit kathythepicturelady blog this Thursday to see a post about another French masterpiece that was endangered during the French Revolution, but now helps all who see it stand in awe of what Christ did for us on the cross and the wonder and miracle of His resurrection. 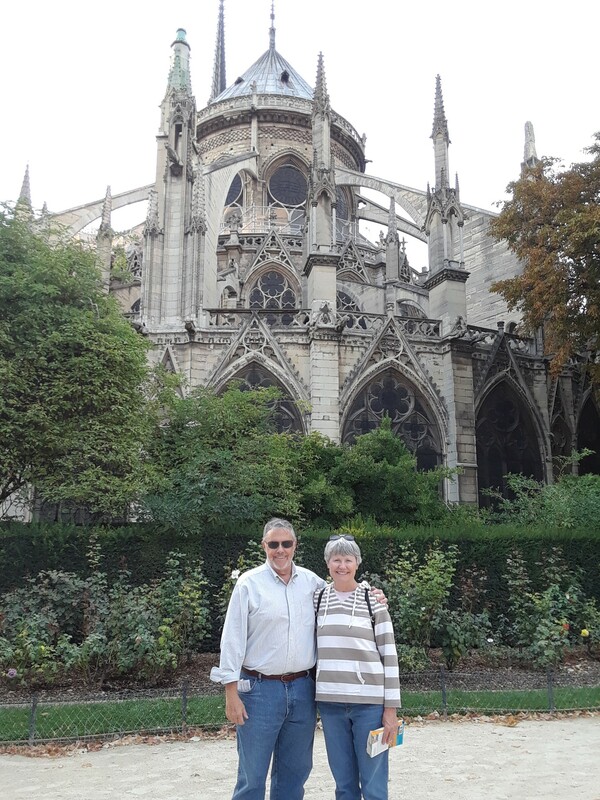 This entry was posted in Uncategorized and tagged Notre Dame, Paris on April 16, 2019 by Kathy The Picture Lady. I have been watching flames engulf Notre Dame today and as a Christian, an artist, and a teacher of Christian history, I am devastated! The destruction of this beautiful, Gothic cathedral is an unbelievable loss to art and Christian and French history, and to Paris, France, and the world. 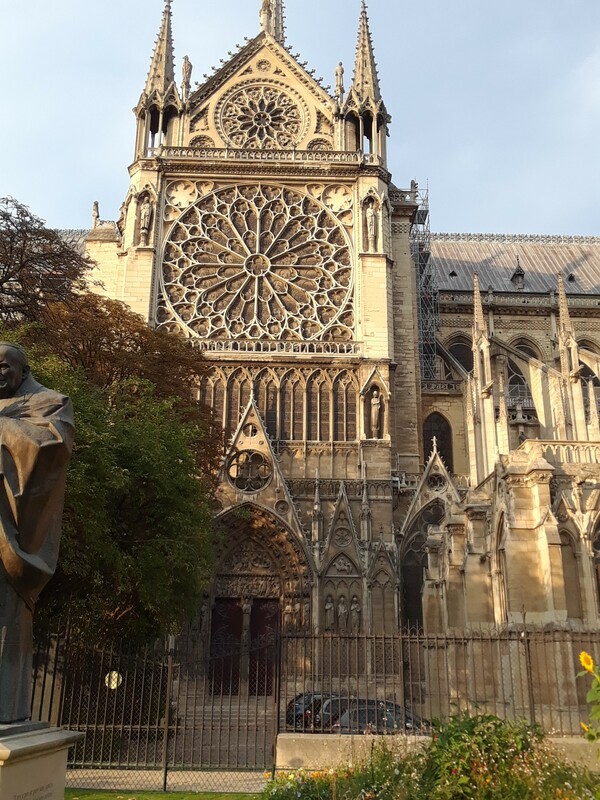 I saw Notre Dame de Paris in person for the first time last fall and loved every part of it from its steeple and flying buttresses to its statues and stained glass windows. We explored the cathedral inside and out and went to a mass to hear the organ and see the church as it was meant to be–a house of worship. 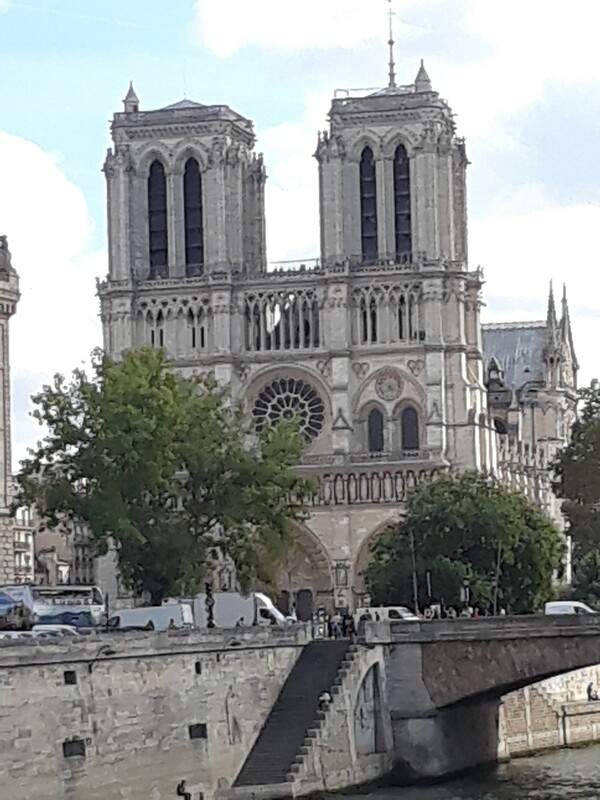 We were in Paris a number of days and stayed so near Notre Dame that we passed it almost every day as we came and went to other churches and museums. I now recognize the places from which all the photos of the fire are being taken and I just can’t believe such destruction is happening to this 800 year-old, world-renowned Christian cathedral! The steeple and the roof are gone. 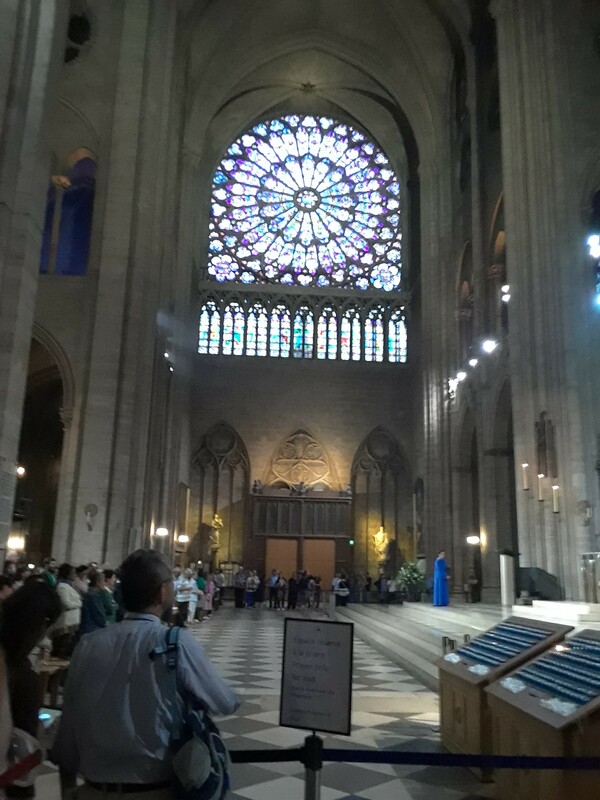 While we wait to know how much will survive, here are some photos we took that bring tears to my eyes but I still want to try to remember Notre Dame de Paris as this beautiful church. Please pray with me that there will be no loss of life from this terrible fire and it will not spread to surrounding buildings! 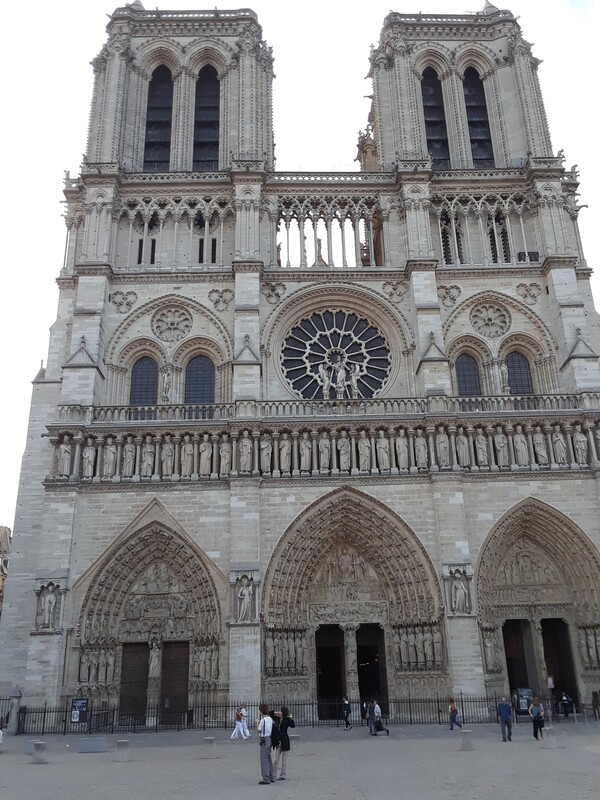 This entry was posted in Uncategorized and tagged fire, Notre Dame, Paris on April 15, 2019 by Kathy The Picture Lady. 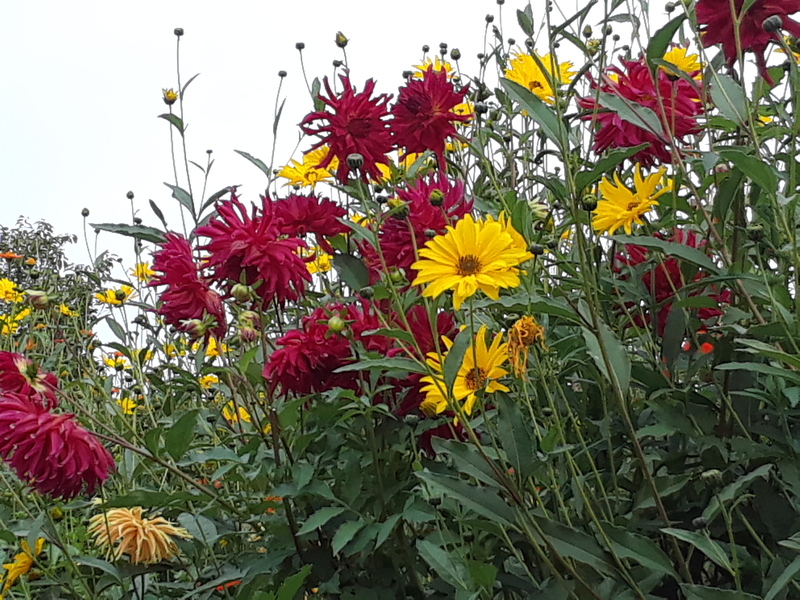 In the afternoon we tore ourselves away from Monet’s sunny garden to make our train connection to Rouen to see the cathedral that Monet painted so many times. As we waited on the platform of the little train station, the weather changed. Wind brought clouds and the first rain of our trip. 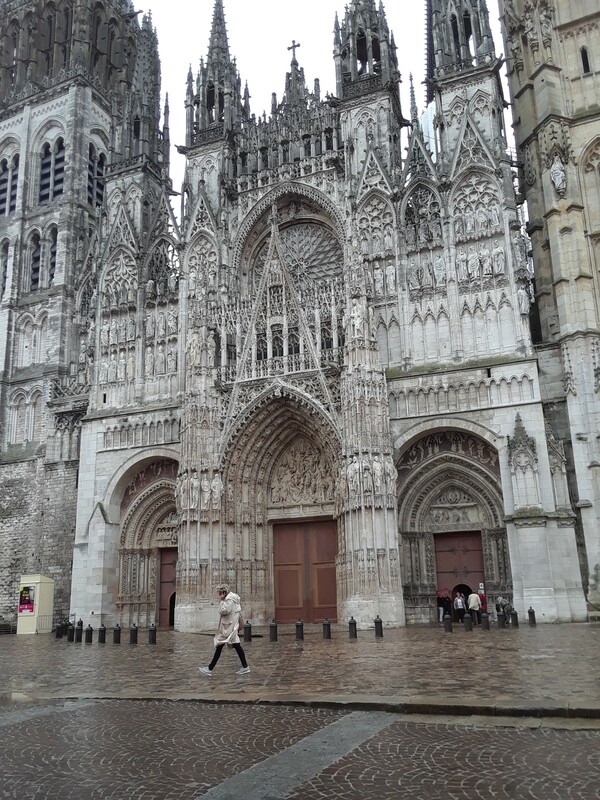 It continued to rain while we were in Rouen, a city on the Seine River not far from the Atlantic. 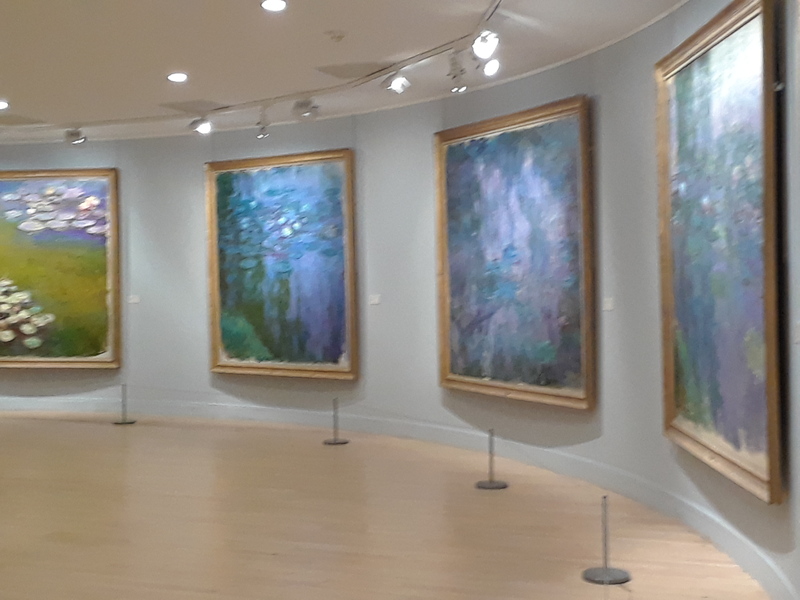 I didn’t mind, though, as one of Monet’s cathedral views is in the rain, and he actually liked to try to capture the effects of rain and fog. 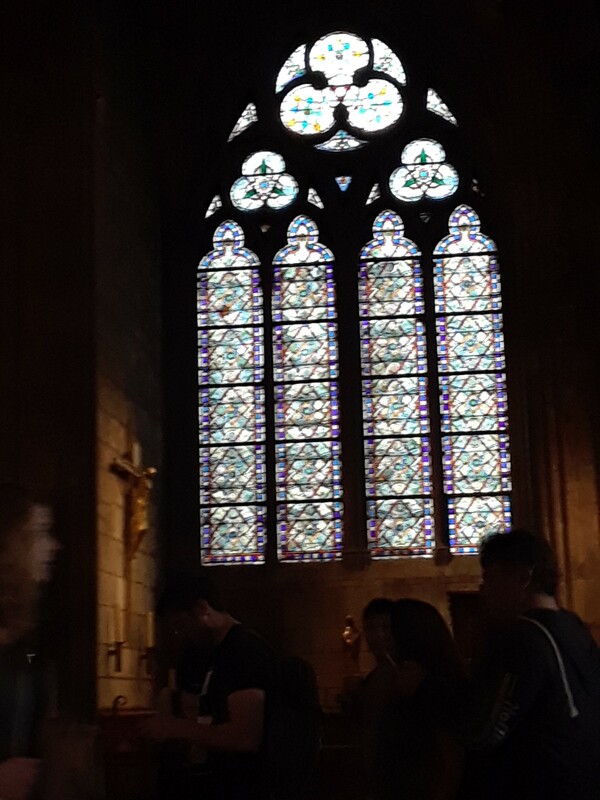 On this rainy Sunday few people were about, and no sun lit up the exterior of Rouen Cathedral or pierced through the stained glass that remains. It’s slim Gothic pillars still soar up to its high vault, and outside it wears its age with dignity and lacy beauty. And some parts of it are really old! There has been a Christian church on the site of Rouen Cathedral since Roman times. Since then it has been partially destroyed by wars, fires, and storms many times, and just as often been rebuilt. The Vikings destroyed the early church and then rebuilt it when they settled the area. The first (Viking/Norseman) Norman duke, Rollo, is buried under his effigy in the ambulatory. 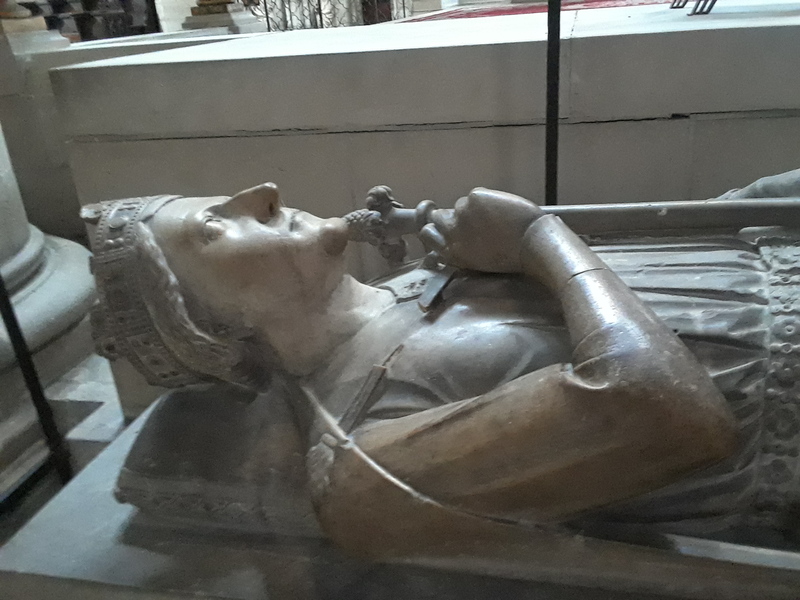 For many, many years Rouen continued to be Norman/English land, and Richard the Lionheart’s heart is buried under his effigy next to his ancestor, Rollo. The cathedral was rebuilt in the new Gothic style in the 12th century, but fires and storms caused more rebuilding in the 13th century. Then in the 1400s, the façade was made over in the highly-decorative Flamboyant Gothic style, so that today the cathedral still looks like it’s wearing a garment of stony lace. 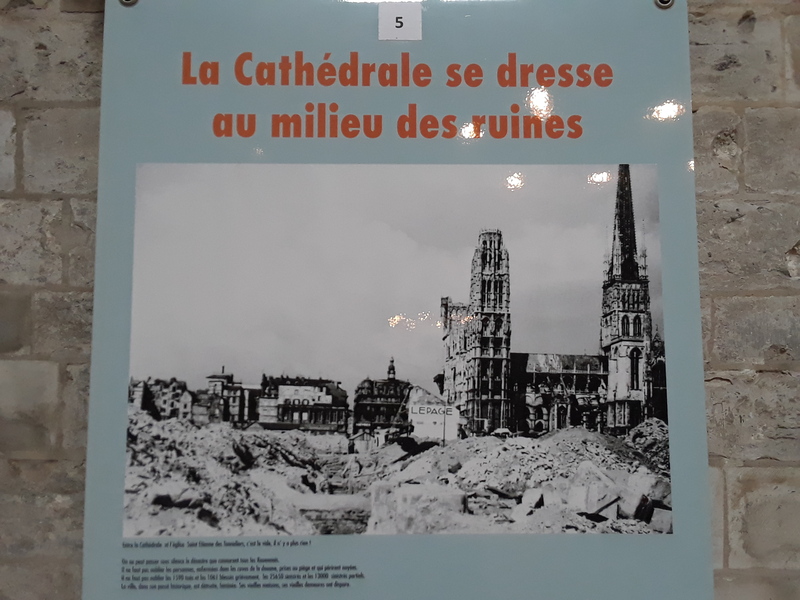 In WWII Rouen was a major supply depot for the Nazis, so the city and the cathedral were heavily bombed. The cathedral suffered several direct hits that caused much destruction. It was repaired, but in 1999 a storm toppled a huge pinnacle weighing many tons, which crashed through the roof and into the choir. When you look up you can still see the repaired place where it came through. 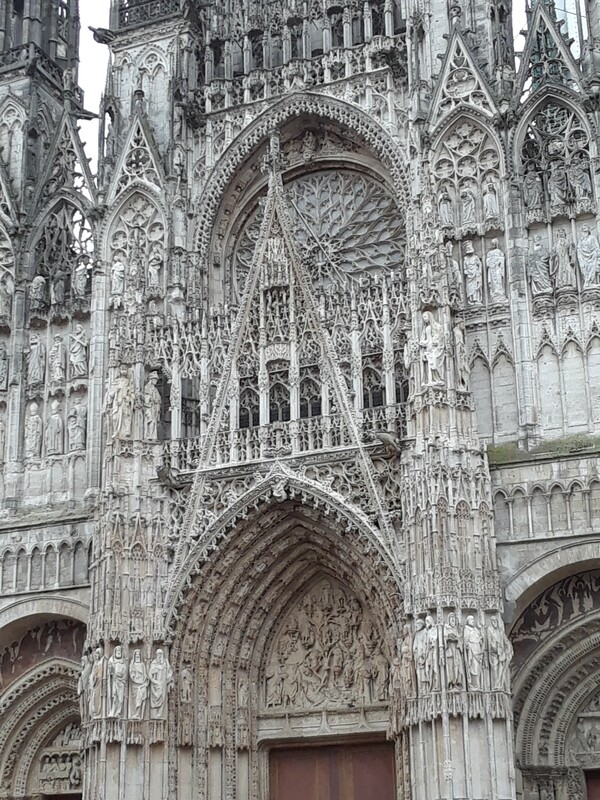 Today Rouen Cathedral is a mixture from all those times—some, like the North Tower, date back to the 1100s, while some stained glass and other sections are from the 1200s and 1400s. 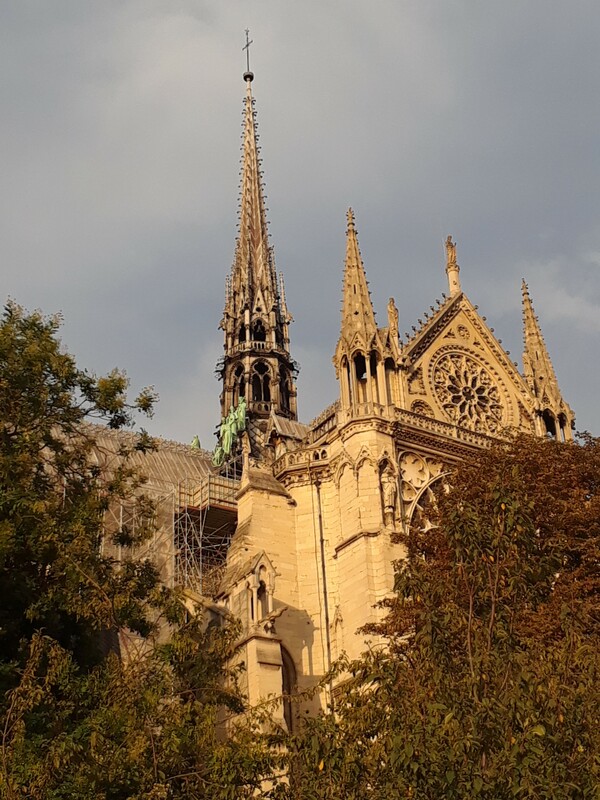 The middle spire or tower, made of iron, was installed in the 1800s, and, of course, repairs from WWII and the 1999 storm are even more recent. 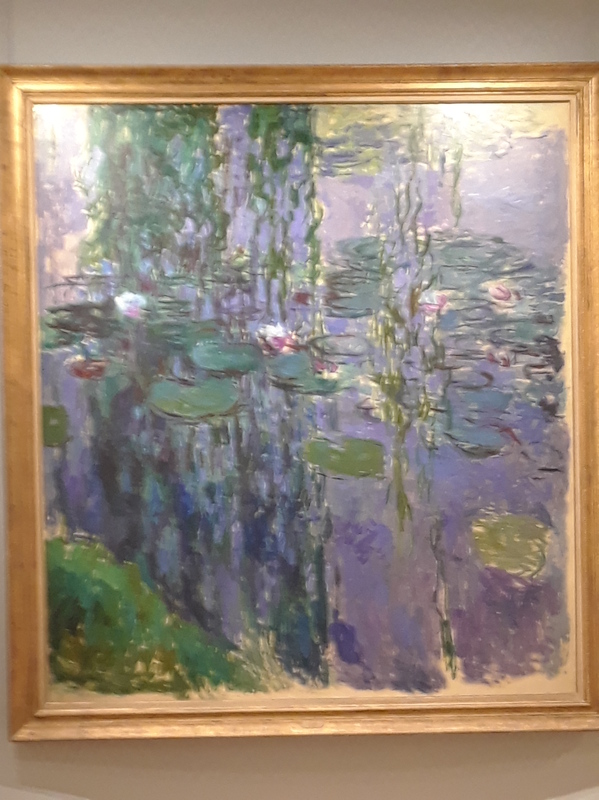 Monet knew this cathedral well. 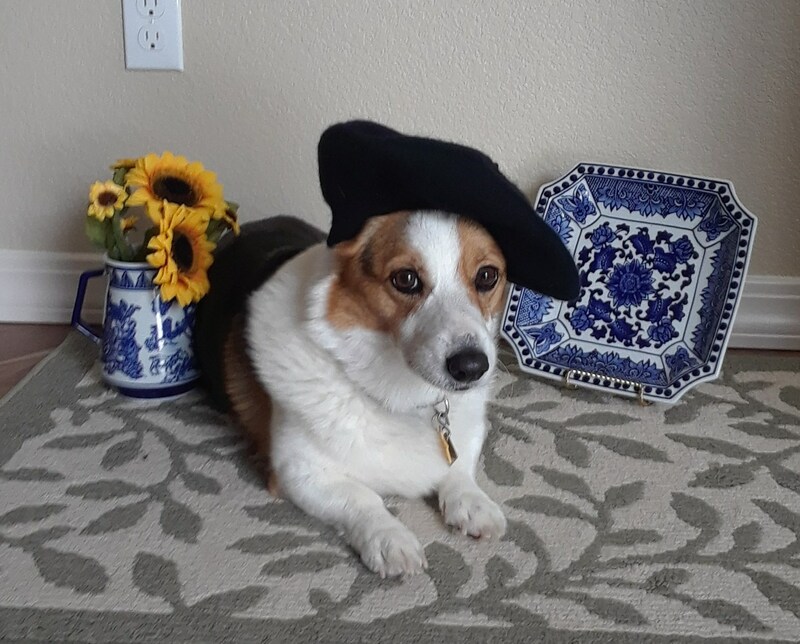 He grew up in Normandy, a brother lived in the city, and it was just a short train ride from Giverny. As he thought about his next series, Rouen with its lacy exterior must have come readily to mind. He rented a room across the square from the cathedral and painted over 30 views of its façade over the next 2 years. Today a sign marks the spot from which he painted. 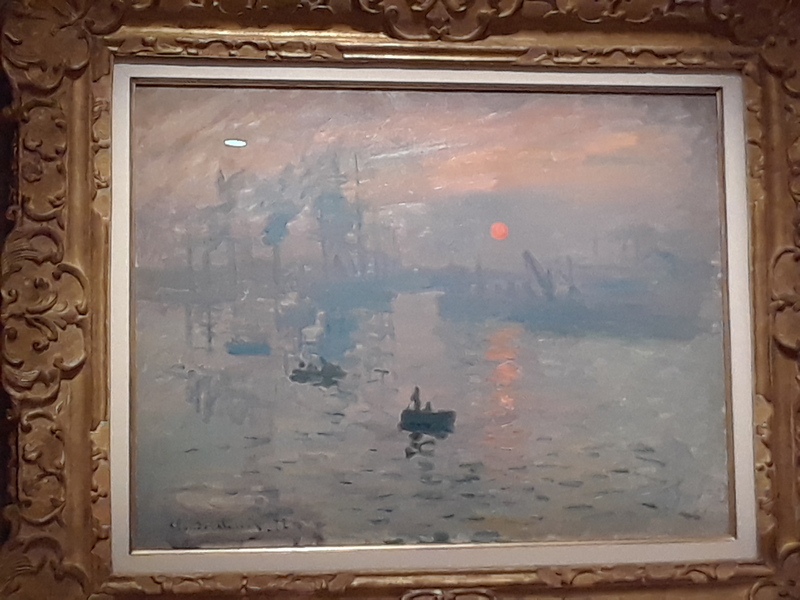 But as with every other subject Monet paints the light more than the cathedral. He studied how the cathedral changed with the sun’s angle and the weather. Some views show the sun rising behind the north tower. Others show the deep shadows produced by full sunlight. It’s an oblique view, although a few of the paintings are more face on. 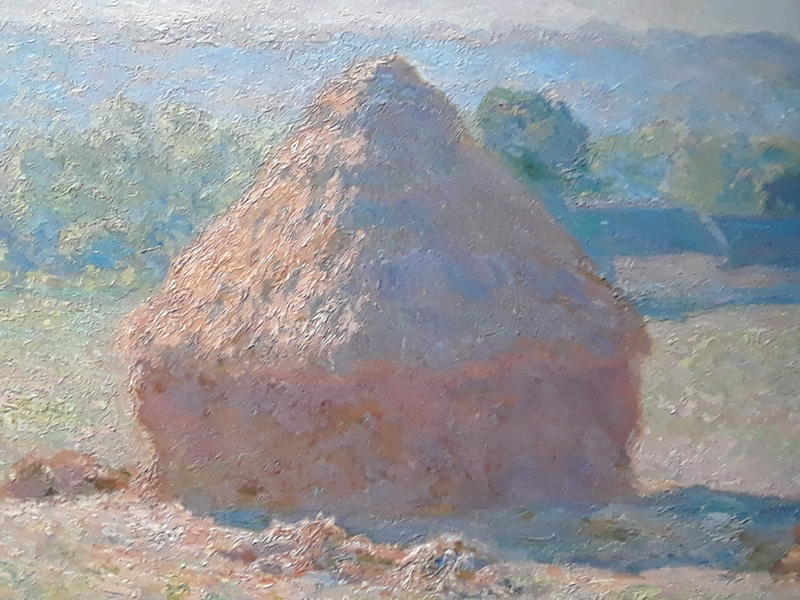 The details of that lacy exterior would defeat most artists but Monet’s short, sketchy brush strokes give the cathedral a lacy texture just as his thick paint gave the haystacks a strawlike texture. One of my favorites is the rainy day cathedral with its many tones of browns and creams. You can see the reflections on the wet cobblestones, just as we did. When 20 of the paintings in this series went on sale, Georges Clemenceau, who later became France’s prime minister, was enthralled by them and bought one. 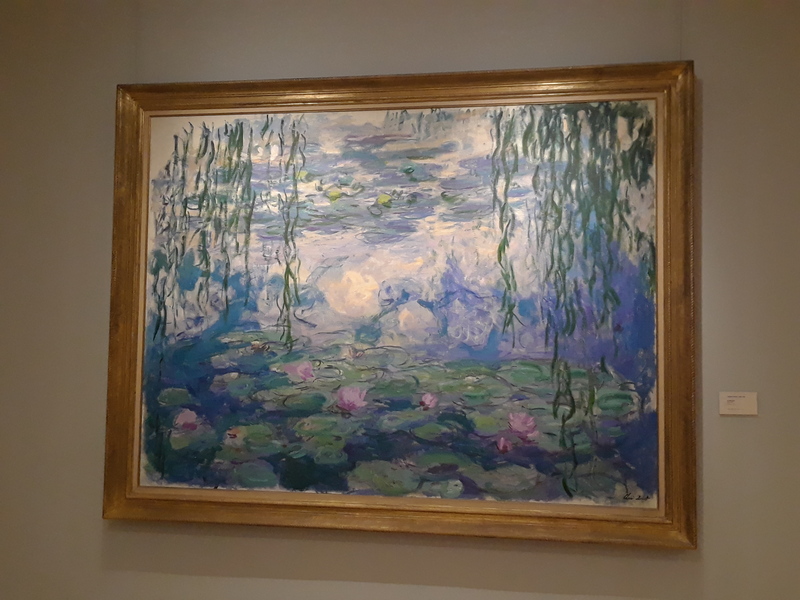 He was a fan of Monet and wrote many admiring reviews of Monet’s work in his newspaper. Find a permanent object or building outside that you can view for a week or so at all times of day and in different weather. Observe how light changes colors and shadows. Write down your obsevations or make sketches. 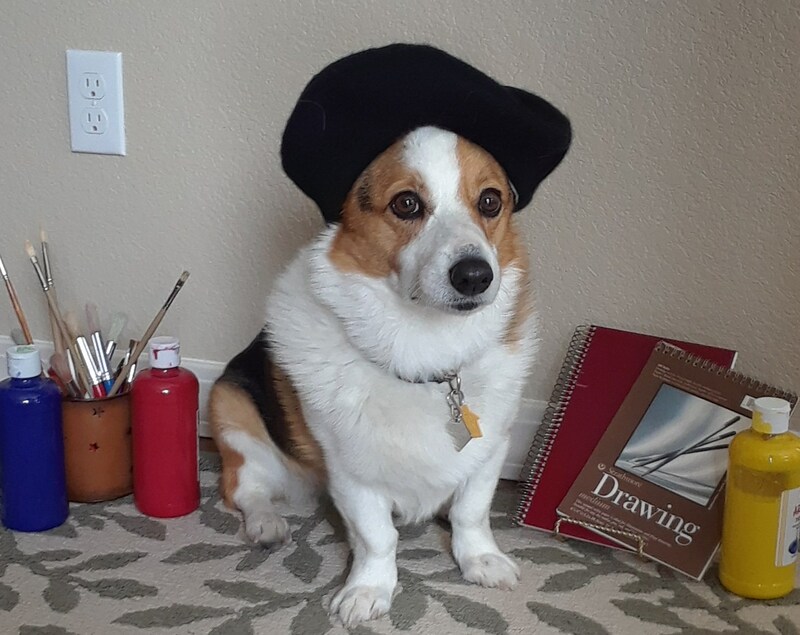 Molly is inspired and ready to paint!! 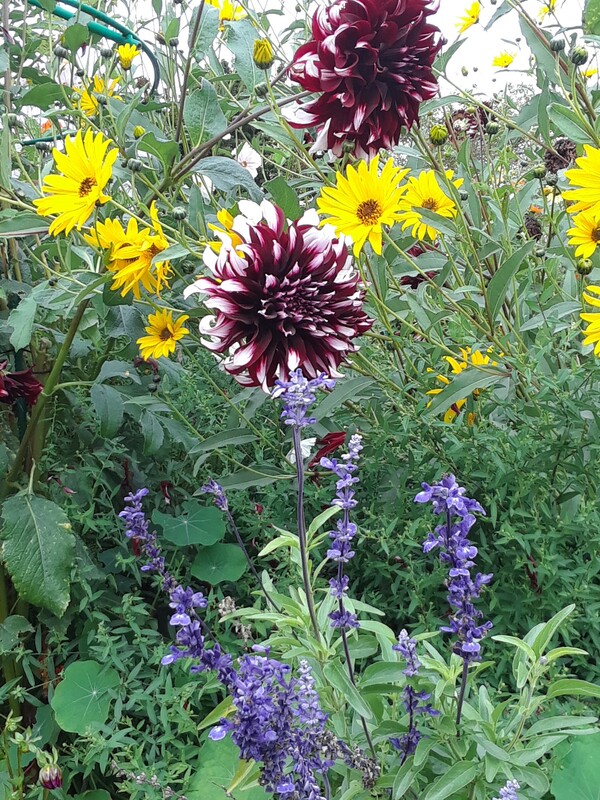 Are you signed up to receive the next Kathythe picturelady post? It will be an Easter post with more photos of the Isenheim altarpiece that I first showed at Christmas. Later in April will be some devotional thoughts based on this whole Cathedrals and Haystacks series. 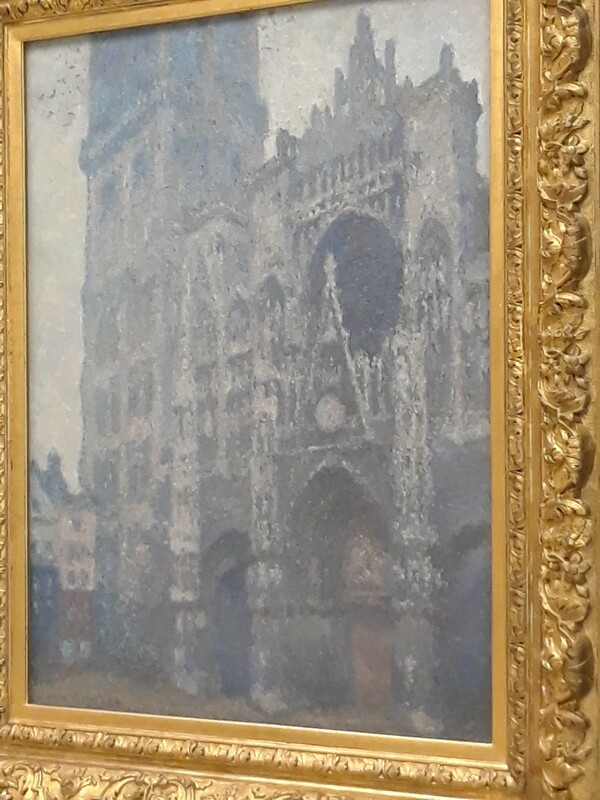 This entry was posted in Uncategorized and tagged Claude Monet, Gothic cathedrals, Impressionists, Richard the Lionheart, Rouen Cathedral on March 29, 2019 by Kathy The Picture Lady. 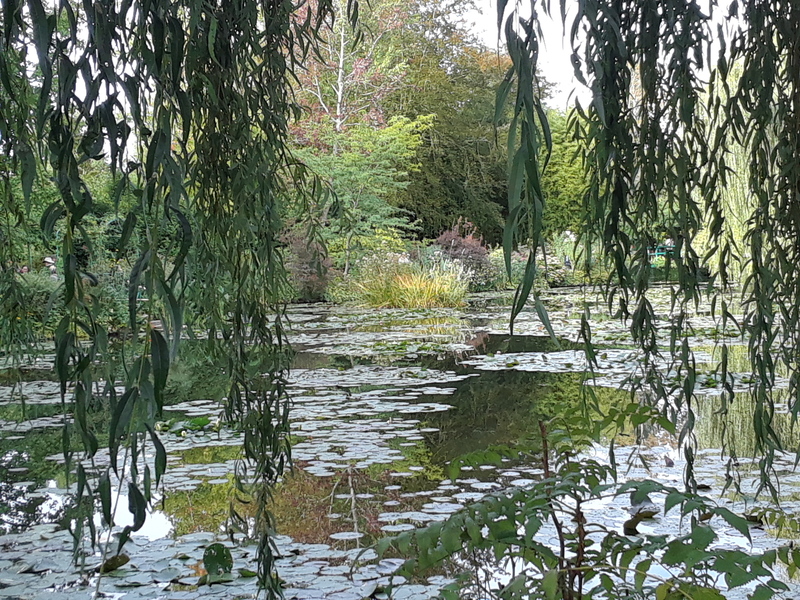 After several days in Paris, we left for Giverny and Normandy, and we’d go by train as the Impressionists did. 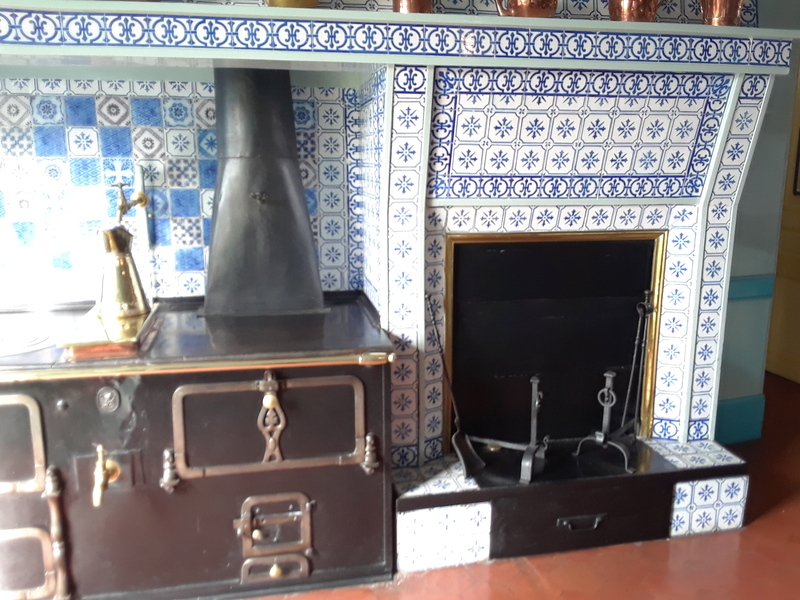 In the late 1800s trains were changing life for people in and out of Paris. They allowed people living outside the city to come in to work. 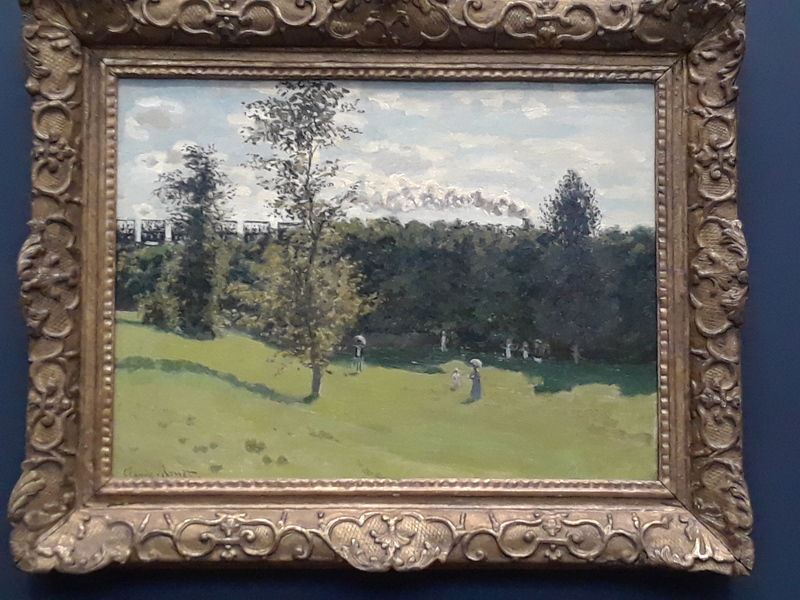 Weekend trains with double decker cars, as seen in this painting by Monet, took the Impressionists and other Parisians out of the city to relax at restaurants, and popular swimming, boating, and fishing spots. Trains and train stations show up in a surprising number of their paintings. They were a part of the modern life that the Impressionists were determined to show. 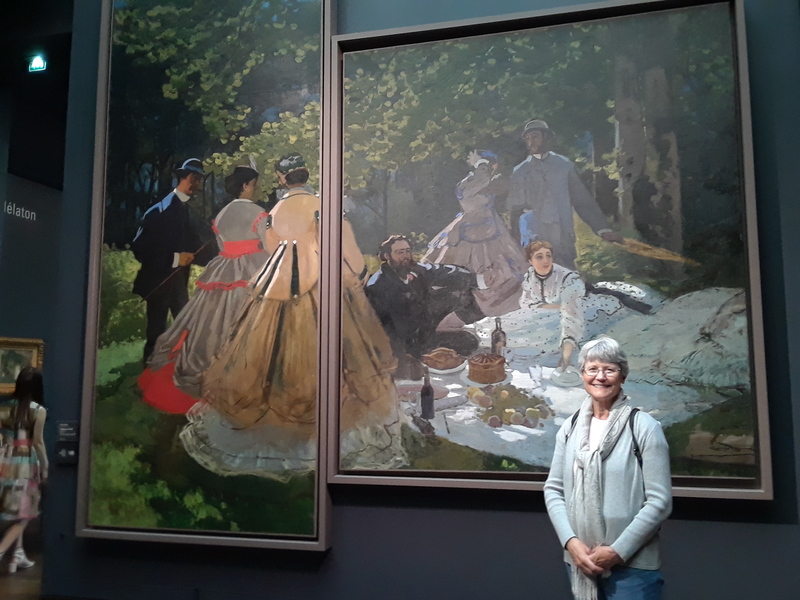 Which is why Musee d’Orsay, a former train station, is so appropriate as a museum for Impressionist art! 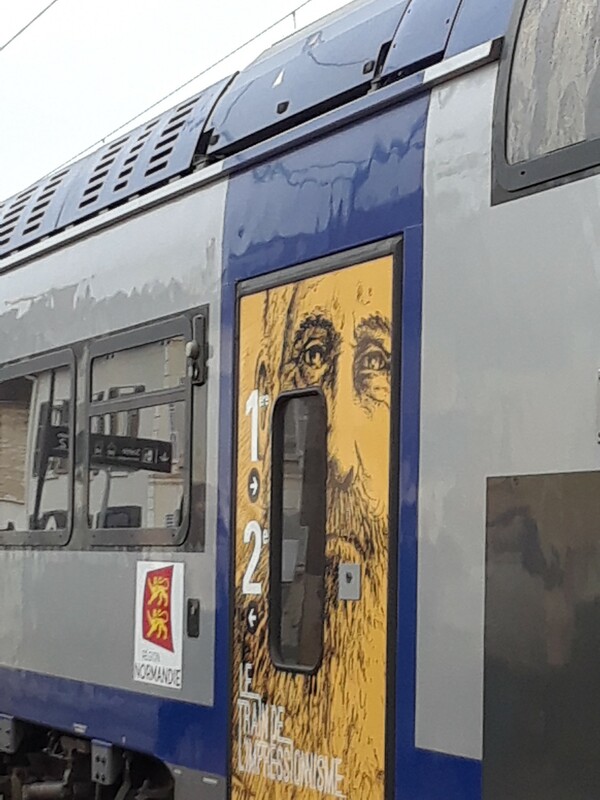 It is Gare Saint-Lazare in the northwest part of the city, where many of the Impressionists lived, that shows up in their paintings. Its trains took people to popular recreational sites along the Seine River as it flows northwest from Paris to the Atlantic. 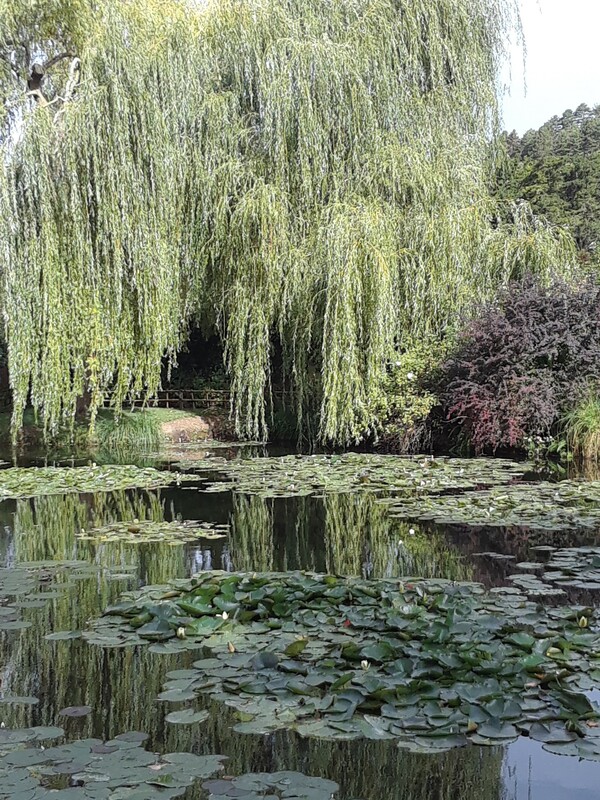 Monet would also have taken the train from there to get to and from small towns such as Argenteuil, and eventually Giverny, where he and his family lived. 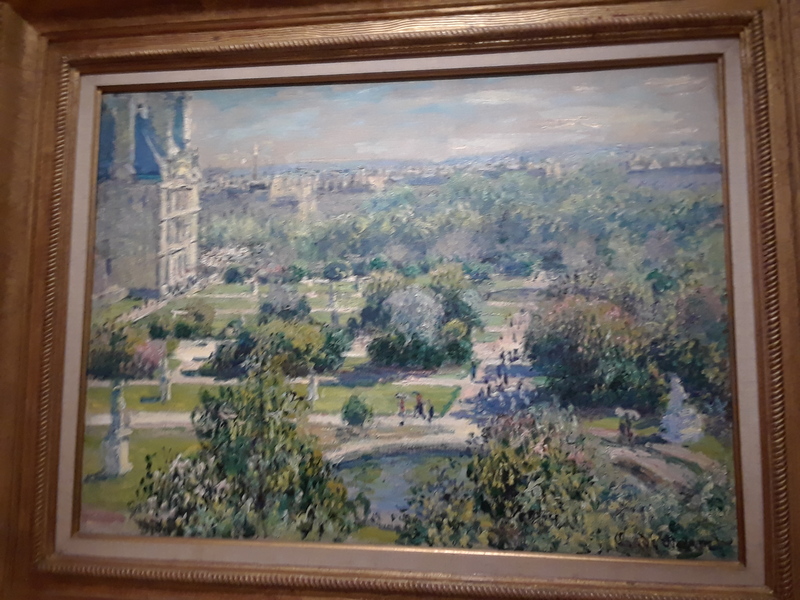 Both Monet and Gustave Caillebotte painted this station. 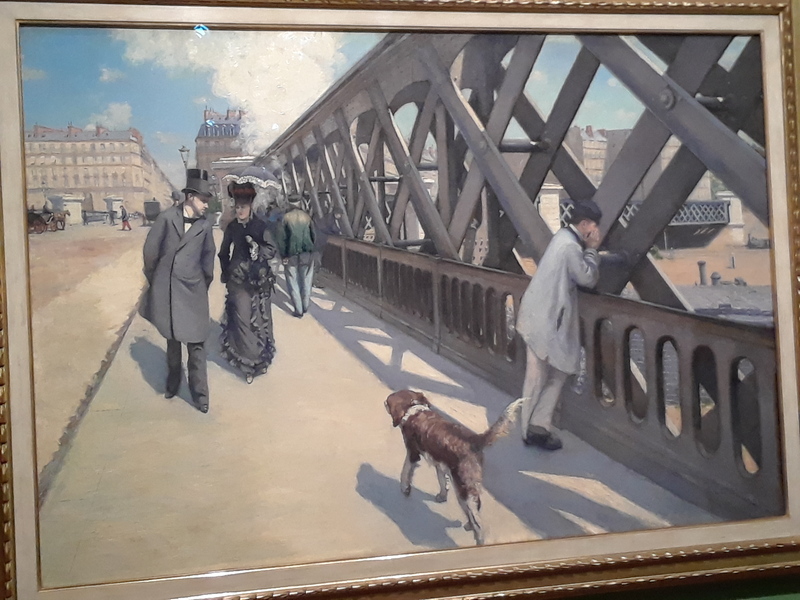 Caillebotte painted from the large bridge that crossed over the tracks behind the station and was more interested in architectural features of the bridge itself. 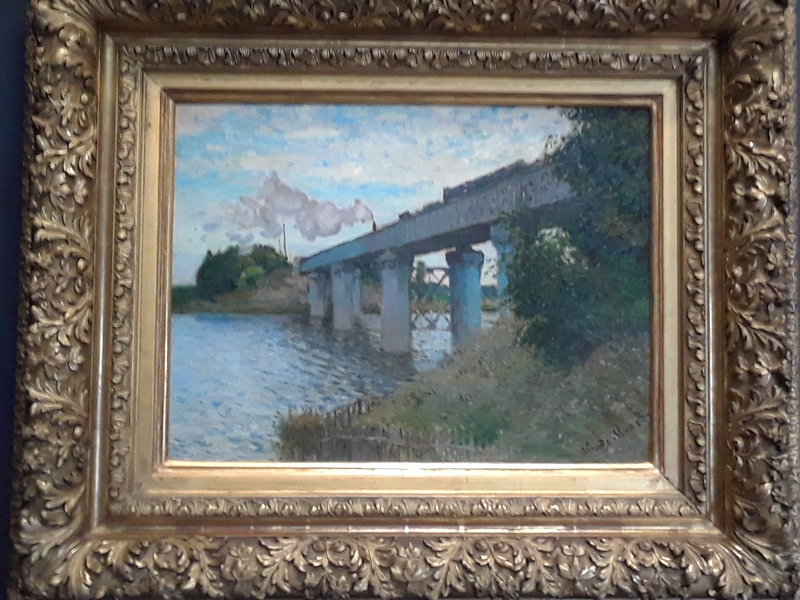 Caillebotte’s painting, pictured below, is titled Le Pont de L’Europe. Monet painted the station from many angles in a number of paintings done in 1877. His interest was, as always, the effects of light on his subject, and he even convinced the station supervisor to delay the trains and produce more steam than usual so he could paint these effects. 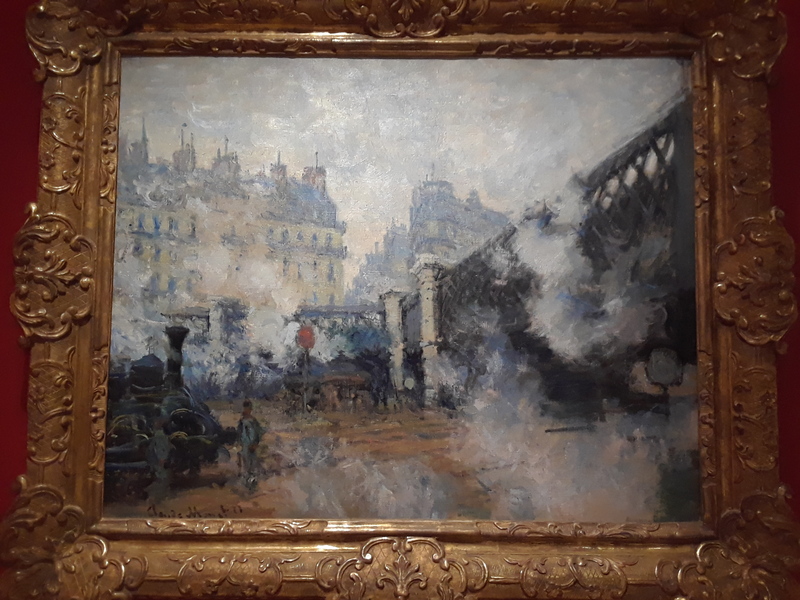 In these paintings steam and smoke billow up in tints of blue and pink and gray to the glass and iron roof of Gare Saint-Lazare. 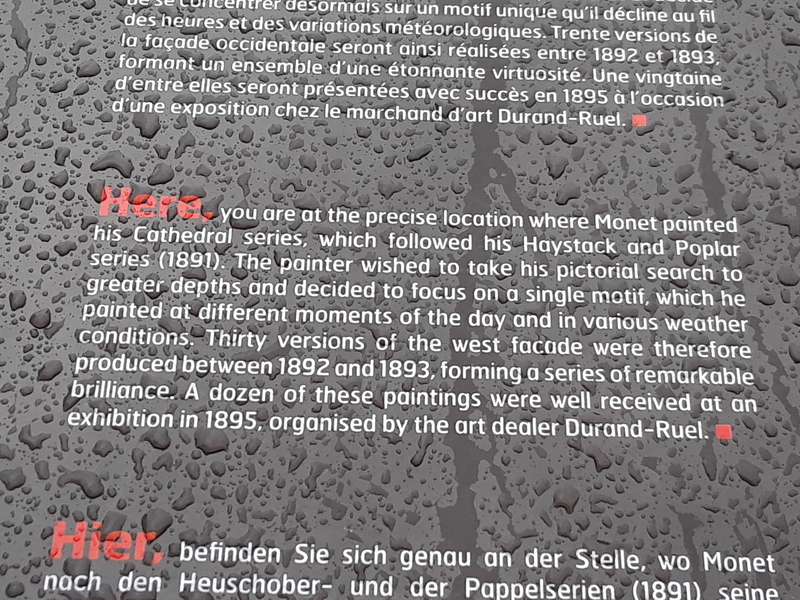 Monet’s painting is titled La Gare Saint-Lazare. 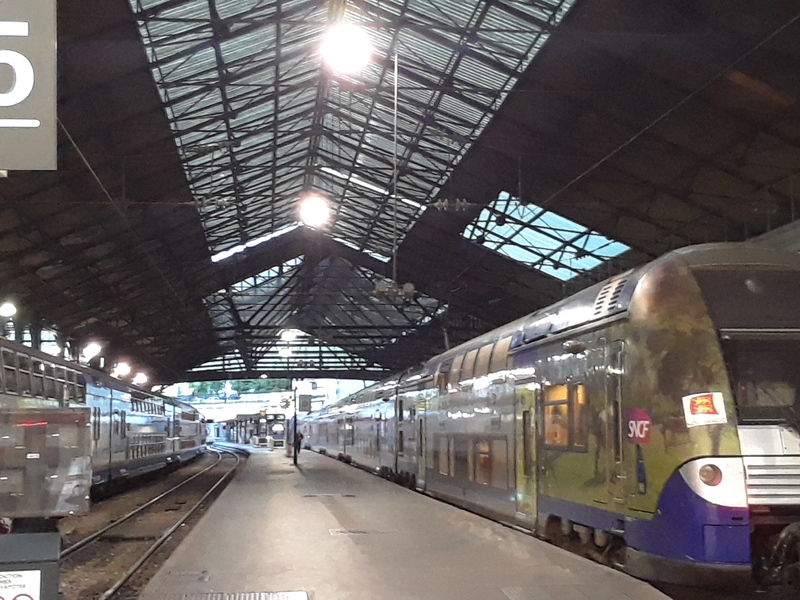 Saint-Lazare is still the main station to travel from Paris to Giverny and on to Rouen and other cities of coastal Normandy, so we arrived at the station early on a Saturday morning. Steam no longer fills the train shed, but people still hurry into the station to catch their trains. 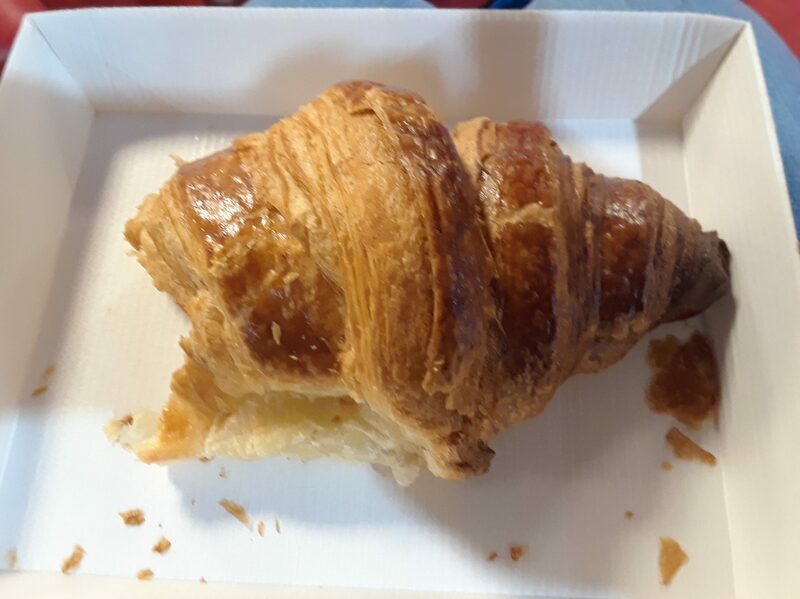 Along with many others, we grabbed a croissant and a cup of coffee on our way to the platforms. A babble of voices impatient to begin their journeys surrounds us. 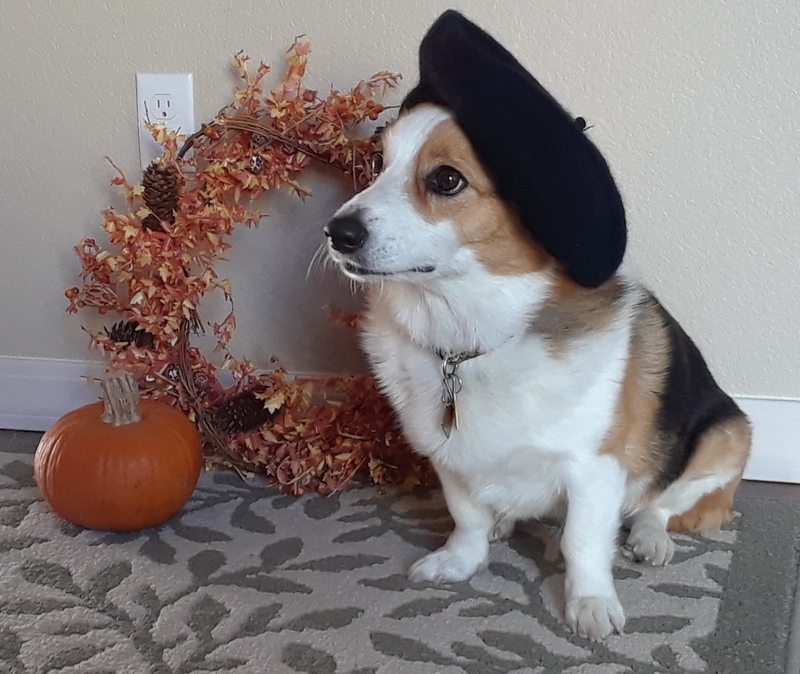 We’re ready, too. 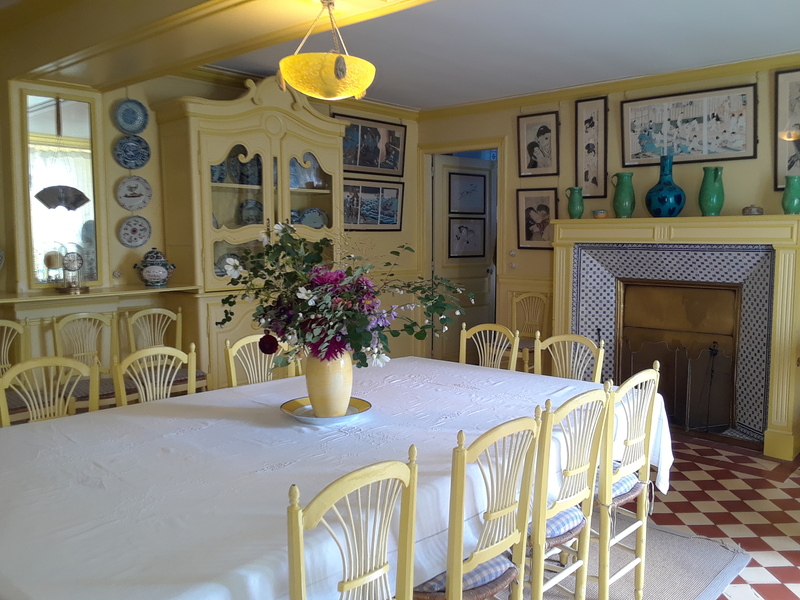 Now that we’ve seen the paintings, we’re ready to visit Monet’s home and famous gardens. 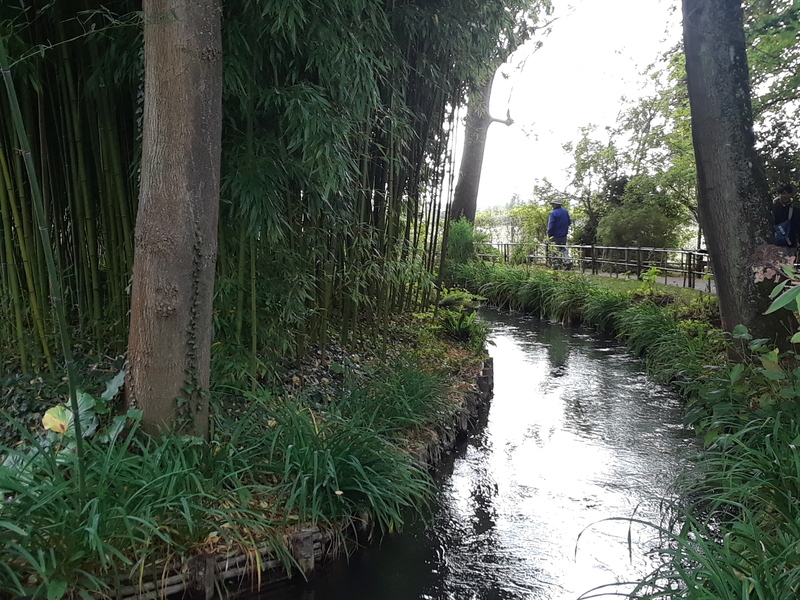 On to Giverny! 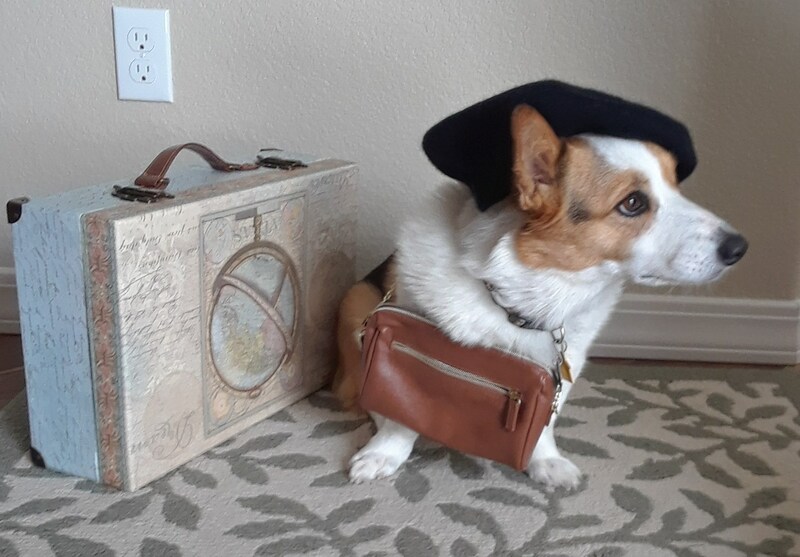 Molly is all packed and ready to go! 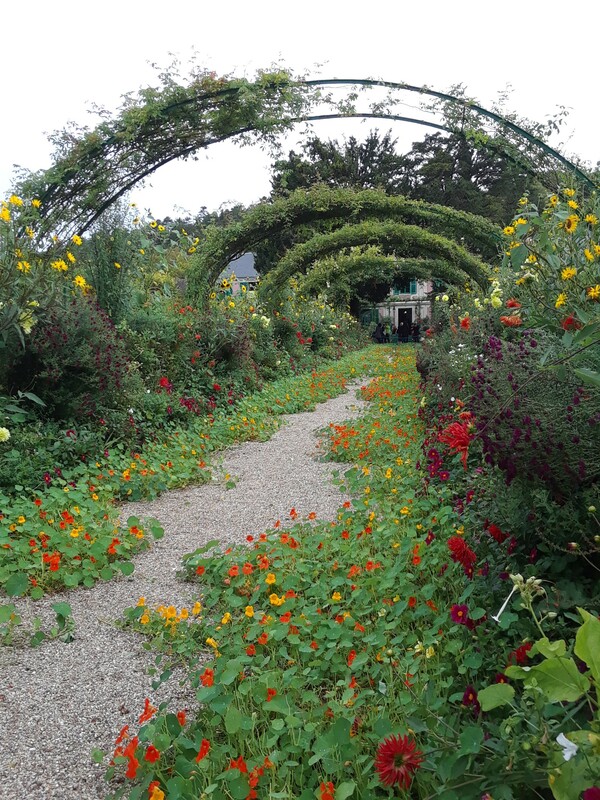 Are you ready to recieve the next Kathythepicturelady post about our visit to Monet’s beloved gardens at Giverny? 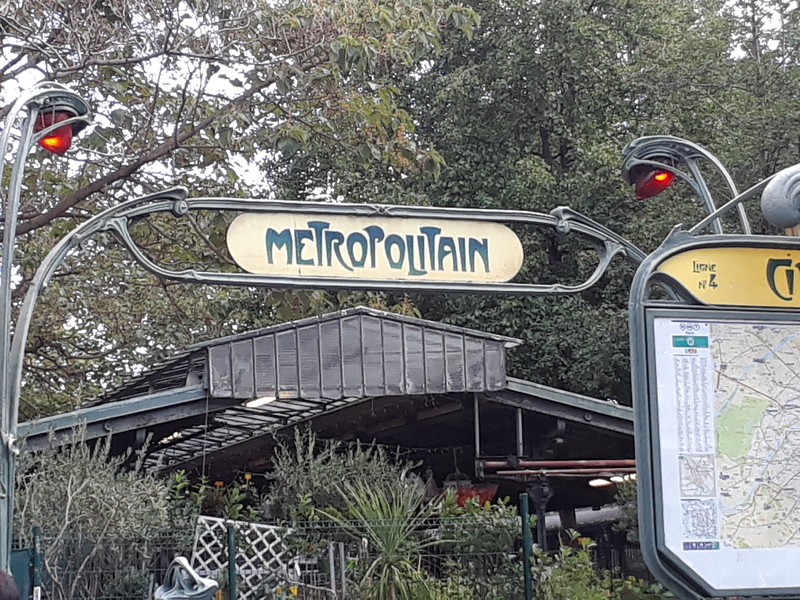 This entry was posted in Uncategorized and tagged Argenteuil, Claude Monet, Gare Saint-Lazare, Giverny, Gustave Caillebotte, Impressionists, trains on February 23, 2019 by Kathy The Picture Lady.